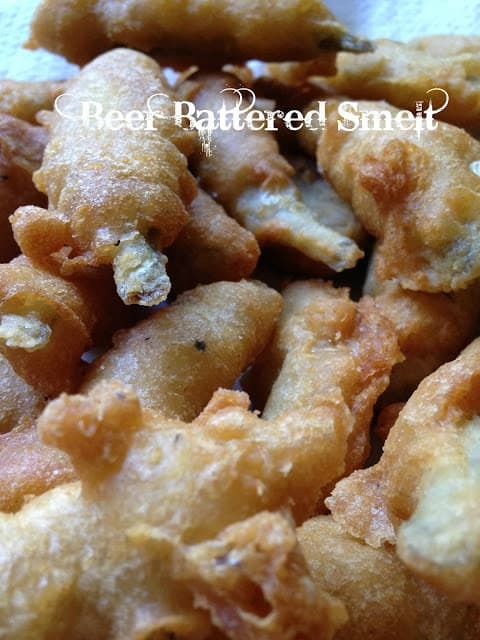 What the heck is Smelt? Fresh smelts are best from September through May. Because they’re very perishable, many are now flash-frozen immediately after being caught. Smelts are marketed whole and are usually eaten that way-head, viscera and bones. 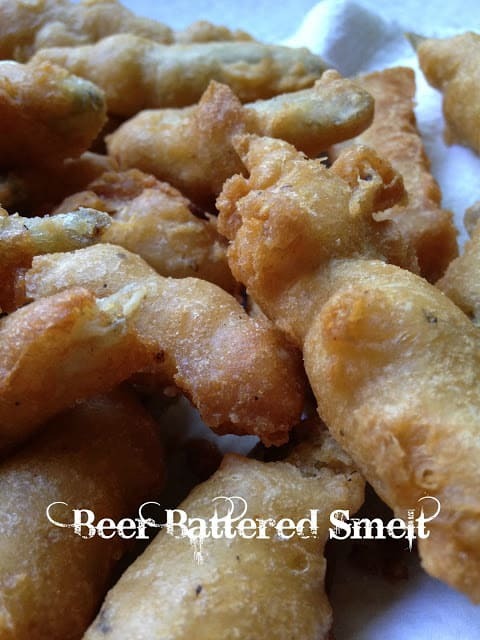 Though they can be prepared in a variety of ways, they’re generally simply coated with flour and fried. Beer Battered Smelt are delicious. My mother-in-law loved her some deep-fried smelt. 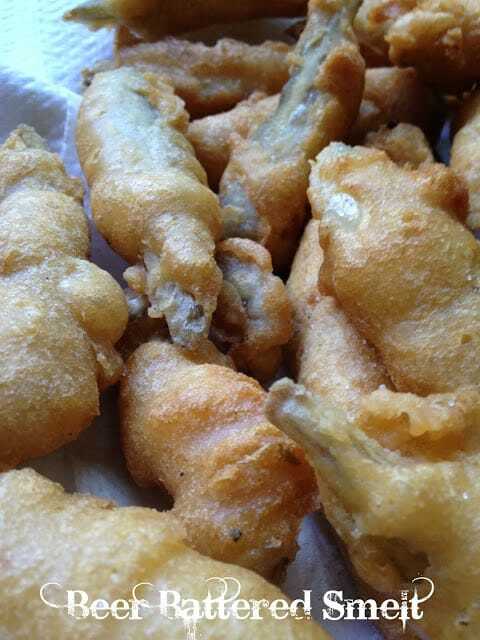 Here in Wisconsin, during the winter months and especially during lent, you can attend a Smelt Fish Fry at most local V.F.W. An anadromous fish is born in fresh water, spends most if its life in the sea and returns to fresh water to spawn. Salmon, Smelt, Shad, Striped Bass and Sturgeon are all common examples. Smelt is anadromous, meaning that it migrates from its North American saltwater habitat to spawn in fresh water. It’s a small (average 4 to 7 inches long) fish with a translucent silver-green back shading into shimmering silver sides and belly. Its delicate flesh is rich, oily and mild-flavored. There are many varieties of this fish, the most widely distributed being the rainbow smelt, found along the Atlantic coast. Mix the 1 1/2 cups flour, salt, cayenne and seafood seasoning in a bowl until combined well. Slowly whisk in the beer. Whisk thoroughly to avoid clumps from forming. Set in fridge to chill. A cool batter will be thicker and coat the fish better. Lightly dust smelt with the 1/2 cup flour. Shake off any excess. Heat oil in a large, cast-iron or other cooking vessel to 350 degrees. Once all the fish have been dusted, submerge one by one into beer batter. 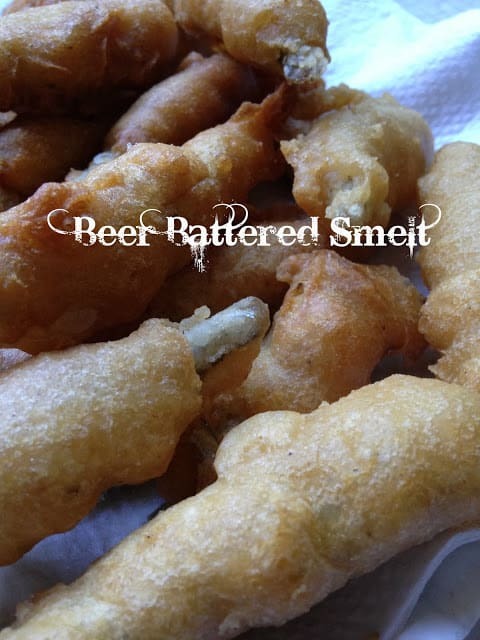 Carefully place battered smelt into fryer in small batches and let fry 4 to 5 minutes, turning until a deep golden brown. Place fish on paper toweling and season with salt.